I am excited to introduce Bri Pruitt, a wife, mom, Registered Nurse and Certified Health Coach. She turned her health around by eliminating common toxins from her body and home. Why this healthy baby food isn’t so healthy. 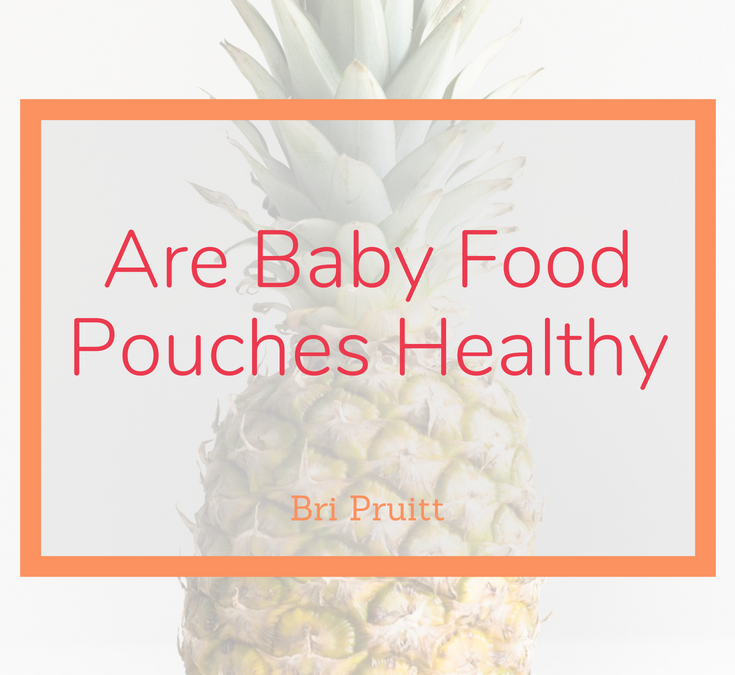 What you must know about baby pouches. We all want to have a healthy family and we do our best to make healthy choices BUT what if some of those choices aren’t really healthy? Unfortunately, there’s a lot of amazing marketing out there that leads us astray (waa-waa-waaaaaa). Let’s use those infamous baby pouches as today’s example. We’re told that the pouches “gets nutritious goodness in them”, are “delicious, mom-approved”, and more such lingo. Pouches are lower in fiber and nutrients. As you can see in the image below, there’s one gram of fiber in one serving size. According to this table, an average one-year-old needs 19 grams of fiber in a day. When we don’t have the fiber with the sugar, it’s like eating spoonfuls of the white granulated stuff. And 8g of sugar is A LOT for a baby or young child! They have no protein or fat which are both necessary for a healthy diet. And what nutrients? 0% of Vitamin A, 0% of Calcium, 0% of Iron. When we heat fruits and vegetables, they lose nutrients. The fruit and vegetables in the pouches are cooked at high heat and then exposed to high heat again when they’re sealed in the package. Another factor is that they sit on the shelf for who knows how long (which also tells us there are preservatives mixed in), and produce starts to lose it’s nutrients immediately after being processed. Fruit is usually the first ingredient. The first ingredient on a label indicates that it is the most abundant ingredient. While whole fruit is part of a healthy diet, we definitely need to consume more vegetables than fruit. Experimenting with different foods and textures is SO important! Your child won’t be eating purees for the rest of his/her life. They need to know that foods come in different shapes, textures, colors, how they taste individually, etc. Babies also need to use small food pieces (ie organic peas) to develop their fine motor skills. They can contain synthetic ingredients. For example, the second label shows that ascorbic acid is an ingredient. It’s often used as a preservative. Ascorbic acid is oftentimes made from synthetic GMO ingredients. Pouches lend to the problem of too much waste. If your child has one pouch a day for one year that is 365 pouches in the landfill. They’re not in biodegradable containers, so they will stay in the landfill. The intense sweet flavor sets kids up to crave sugar. Sugar is one of the top contributors to negative health issues and most of us are eating waaaay too much of it! The RDA (recommended daily amount of sugar) for kids is 11g. Now keep in mind that ‘kids’ refers to 2 years old thru 17 years old so it’s safe to say that it should be way under 11g for a 2-year-old and a 17-year-old can consume closer to the adult amount (women – 24g p/day; men 36 g/day). Foods are disguised in pouches. I never recommend hiding vegetables from kids because they need to know it’s important to eat them. They need to see them, touch them, smell them and then chew them. When my daughter was little, I remember reading that it takes at least 15 times of a child seeing a food to want to try it and then another 15 times of eating it to be able to know if they really like. Buying whole fruit and veggies is cheaper. If you’re buying the organic pouches, you’re paying around $2 per pouch. I’ve bought a whole bag of organic apples for around $4. The #1 most important habit that we MUST develop in order to experience true family wellness is reading labels. I have two posts up all about learning to read the nutrition label. This first post is where I go over the general sections of the label and what they mean. This post goes more into specifics about the sections, some changes that are coming soon and which section we need to stop referring to. While the best option is to make your own baby food at home, I understand it’s time-consuming. So there are better options out there for pre-made pureed healthy baby food. I had the chance to meet Alyson, the creator of PureSpoon. 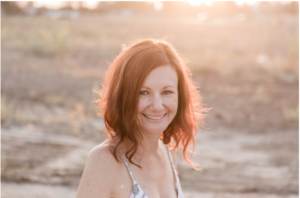 She’s a mom and fellow graduate of The Institute for Integrative Nutrition (click here for a free class). She didn’t like that pureed baby foods were nutrient deficient, high in sugar, and sometimes even cooked in their plastic containers! So she started making her own organic, nutritious baby food using HPP (High-Pressure Processing) instead of the nutrient killing pasteurization. That’s how PureSpoon was born. They have wonderful options that actually have texture, that contain more veggies than fruit or the ‘Simply’ line is just the one veggie or fruit so your little one can get used to the taste. You can find the Vegetable Medley Sampler pack here and the Simply Baby Food Sampler pack here. Another brand I found that uses organic ingredients and the HPP method is LittleSpoon. Little Spoon and Pure Spoon seem pretty similar in quality, so if you need the premade baby food these are both great options. The only downside to both is that they’re in plastic. Even BPA free plastic has harmful chemicals (that could be a whole new post!). The healthiest and most cost-effective option is to make it yourself and store it in glass containers. There are lots of recipes and info on baby food making on Google and Pinterest. Bri Pruitt is a wife, mom, Registered Nurse and Certified Health Coach. She turned her health around by eliminating common toxins from her body and home. She is passionate about guiding moms through eliminating toxins so that they can have a truly happy and healthy family. Learn Bri’s top ways to naturally boost your immune system here.